Most of get our water supply from Southern Water, but there is a significant difference in your payment arrangements. For those on a meter things are pretty straightforward – you pay for your measured usage. Your meter is read by the supplier once or twice a year, but you should get a meter reading when you move in to and out of a property. You certainly don’t want to paying for the previous tenants supply. If you have received a bill, check to see if it is an actual reading or an estimate. The supplier will always overestimate a households’ usage, which isn’t such a bad a thing as it this should mean a rebate is due at some point. If you have received an estimate, try to take a reading yourselves or ask the water company to come and take one. You can get then the bill adjusted retrospectively and have your monthly payment adjusted accordingly. Southern Water show you how to read your water meter. If you haven’t got an accessible meter, things are a little more complicated. 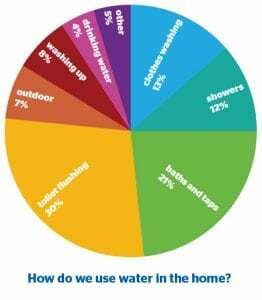 Older flats in purpose built blocks may not have individual meters, so this means your estimated use is based on the ‘rateable value’ of your property, which is rather an antiquated way of estimated how much water you use. This is because the rateable value is based on how much rent the property attracted between the 1970’s – 1990. You can’t appeal the rateable value decision, but if it is significantly higher than the average for a household of your size you should contact the water company or request a meter.